This week we’re checking out the views from Top of the Rock in New York City! 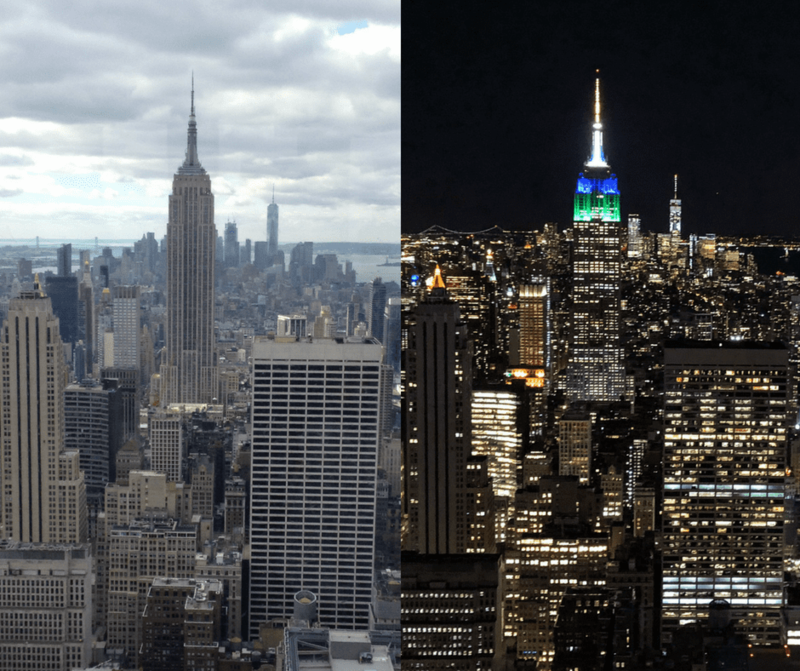 I’ve ventured to this open-air observation deck at Rockefeller Center on two separate occasions: my October 2016 Trip to NYC and my recent April Trip. Not such a great view of the park at night. This pic was taken last April(2018) and it’s amazing to see a new skyscraper go up in NYC! If you’re heading to the Top of the Rock strictly to see views of the park I would recommend going during the day. The view of the Times Square New Years Eve ball is really cool to see from 70 stories! How about these gorgeous panoramic night views of the Chrysler Building, Empire State Building, and Times Square?? Of course, I saved the best view for last! the Empire State Building is beautiful to see. Although in my opinion…I do love NYC at night better. To me it’s just more alive, more enegetic…maybe it’s all the flashing lights or something. If you decide to pay upon arrival the cost is $39.20 per person. I was sponsored by Smart Destinations on my April trip and I highly recommend getting the NYC Explorer Pass. For $89.00 per person, you can choose 3 from a list of 80+ attractions. They do offer upgrade options on the pass as well if you’re looking to take on more than 3 attractions during your visit. This pic was taken on my Christmas trip to NYC back in 2015. During the summer this rink is covered and used for outdoor seating by the restaurant located here called The Sea Grill. enjoy the day views and then watch the sun go down on the city and the buildings light up. That way you get the best of both views!! The Empire State Building from Top of the Rock at night is definitely a must see!! Have you been to the Top of the Rock?? Tell us about it in the Comments Below!! Planning a trip to Top of the Rock at Rockefeller Center and need a question answered?? I had a view of Rockefeller Center from my Wellington Hotel Room! Check out my Full Review Here!! Subscribe Now for More NYC Planning Articles!! I am more of a country girl, but I do love visiting the city every now and then. My cousin LOVES New York and she tries to visit at least once a year. Awe you’ll have to send her to the NY section of the blog! Yea, I grew up in South Carolina so I know all about that country girl life. I actually prefer hopping place to place. I think I could honestly adapt anywhere and enjoy the surroundings. I just love traveling. I love the views from at night. I went to New York once, but it was when i was like 15 so I barely remember. I think we went up the Empire State building, but it was during the day. Also, I barely remember it.